As I mentioned a few posts ago, I recently began homeschooling one of my girls. Not something we had planned. Not something I thought I was equipped to do at age 47. I’m still not feeling too equipped, but I am glad we made this decision. She is less stressed, I am less stressed, and well, that means our home is a more welcoming place, a more peaceful place. It is such a blessing to spend this time with her one on one, to hear her thoughts. It has also been a blessing to have a little extra time and energy for her twin sister when she gets home from school. I don’t regret any of our past choices. We began our educational experience in public school. We were fortunate to have a wonderful little neighborhood school to attend. For those not from Little Rock, AR, you have no idea how unusual this is. We had incredible teachers and met lifelong friends. It was here we discovered ADD and Auditory Processing difficulties. It was here we met an incredibly qualified group of audiologists, speech therapists and educational support staff. We moved from public to private around middle school. We have enjoyed a medium size Christian private school. The girls have had opportunity to grow in their faith, as they have grown in knowledge. Now, we have one in private and one homeschooling. In days gone past I would question my sanity or become bogged down looking back, wondering if we had made a mistake along the way. But as a more seasoned Second Season Mom I am content to accept that each day is a new day. Our choices are based on the here and now and what seems best for the future. Change does not mean anything was wrong with past decisions, it just means there is something new ahead. 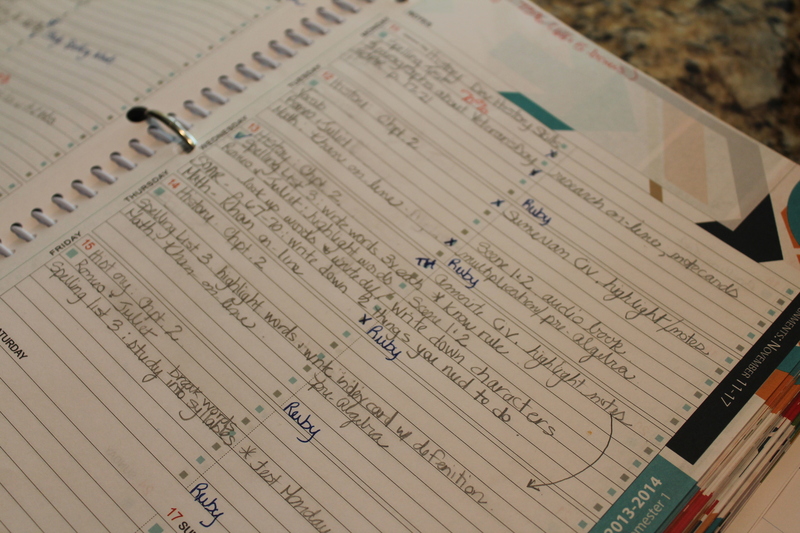 The biggest hurdle has been for me to have a sense of organization and knowing the “plan” existed. Fortunately I have an incredible sister-in-law who has an education background and has/is homeschooling all eight (*) of my nieces and nephews. Thankfully there are a host of moms out there in this blog world so willing to share and encourage and numerous links to some incredible resources. Not to mention, how blessed I am to have a great Mardel Christian Bookstore (http://www.mardel.com/) close by. Anything I couldn’t get help with elsewhere their knowledgeable staff has been able to provide. 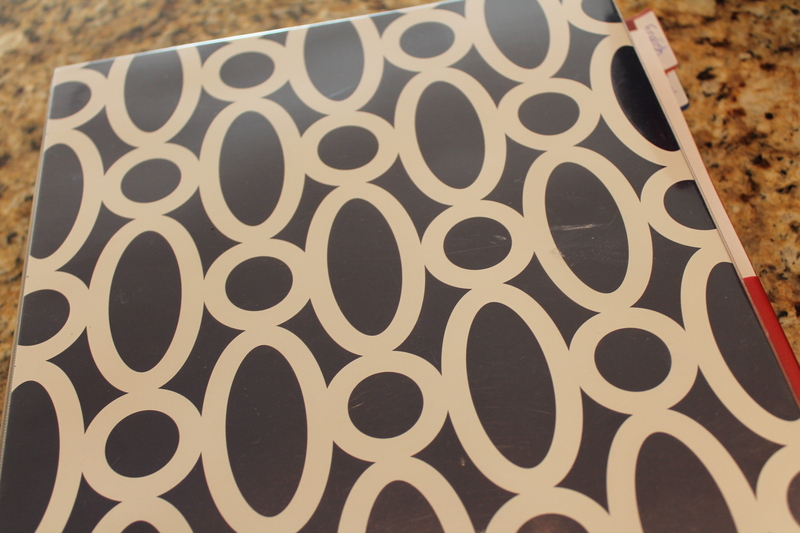 I began my organizational process by purchasing a cute three ring binder. Isn’t that how all projects start? 🙂 Of course, Target was the place to go. I added a pocket divider for each of the core classes. I use these to store tests, project ideas, extra notes and/or resources. In the front I put the most amazing homeschool planner I have seen. It is specifically for high school. I am telling you, if you like paper planners, want little tips and need a daily docket along with long range planning pages this is it!!!!! I found this item at Mardel. It came highly recommended and so far I am more than satisfied. 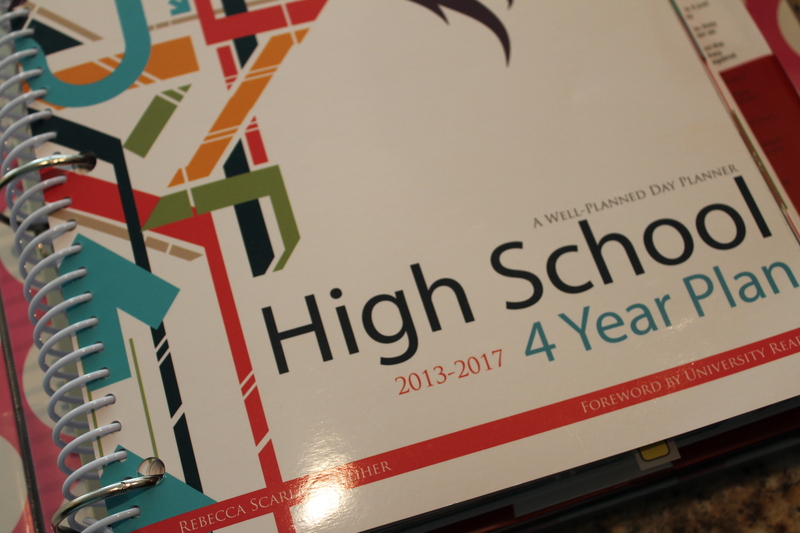 I don’t know that we will finish high school as a homeschool student, but either way, this helps capture everything we need and comes with a discount code for a subscription to a great college prep site. I really am able to keep everything I need right at my finger tips in this great binder. When we are done for the day we can put it on the shelf, out of sight, out of mind. Just like I like it. Of course beginning this journey with a high school student meant we didn’t really need a big space designated. Just a table to utilize, the lap top and then some place to coral all the books and supplies. So… out of the closet came a trusty Thirty-One product. It too has been the perfect tool. 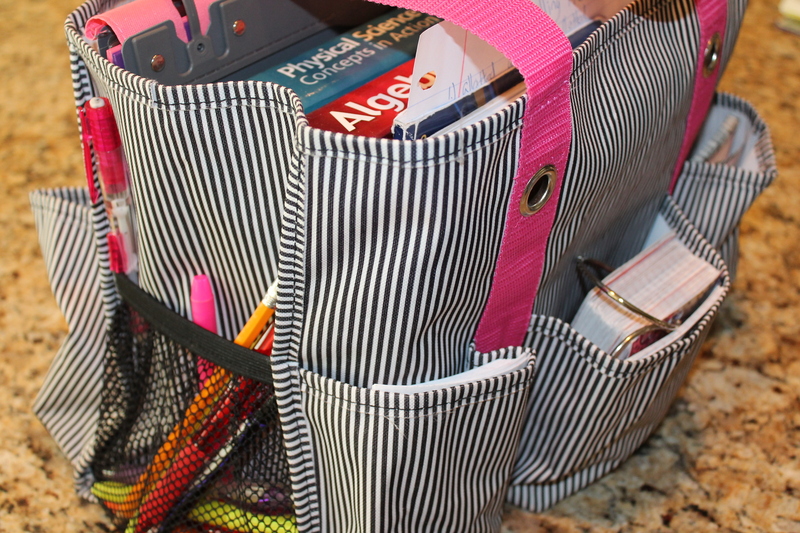 One pocket holds extra index cards, while one holds pens, pencils and highlighters and another holds the calculator. We have pockets to spare! Inside she keeps her three ring notebook and textbooks. We are also able to fit the index card box for grammar. Mom’s only rule is that everything go back in the tote when we are done. We keep it tucked next to the breakfast table where we meet to begin our day. If finding the right tools and having everything in its place were enough to have success we would be swimming in success. No doubt it helps, but she and I are both finding we must work diligently on self-control and self-discipline. I think as we approach week three we are just about to get the hang of our schedule and I am making the necessary adjustments to my personal calendar. Lesson 1: While I can get a few chores done during our designated homeschool time, I absolutely can not focus on real estate, organizing business or blogging. I can do a little personal planning and/or reading, but outside of that I really have to be fully committed to the “one thing”-guiding her. More than ever my time blocking practices need to be adhered to. More than ever I have to know my priorities. More than ever my afternoons have to be attacked with purpose. So, if you have considered homeschool, but haven’t taken the leap, I encourage you to do so. But, only if you truly believe it is that right next step. It is hard and it requires sacrifice, but it is worth it and it is doable. Even for this 47 year old mom who has zero educational background! ← Get Ready: Holiday Planning Begins NOW!